There are few professions more important to our nation’s future than teaching. 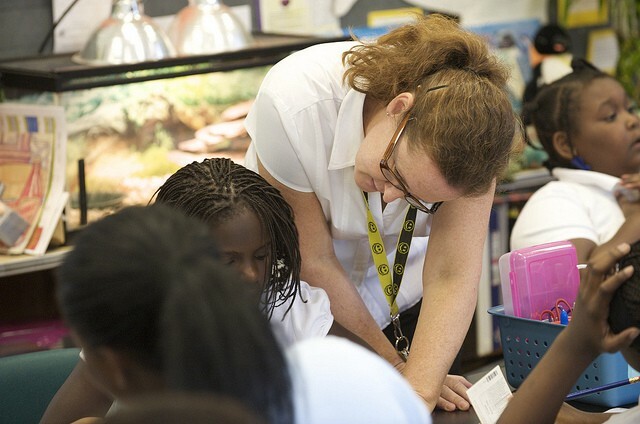 Teachers help students acquire the knowledge and skills they need to succeed in the global economy, spark their intellectual curiosity, and support their social-emotional growth. Teachers also help ensure that all students, regardless of their background, are given equal access to a quality education. Educators have played a huge role in the progress made by schools and students during the Obama Administration, helping push the nation’s high school graduation rate to a record high, cutting the dropout rate to an all-time low, and preparing a million more students of color to enroll in college. To keep our nation competitive and make the American dream of equal educational opportunity a reality, we need to give every measure of support to educators and honor their expertise in the decisions that affect their daily work. From the beginning of his Administration, President Barack Obama made significant investments to support teachers and the teaching profession. When the country was grappling with the Great Recession, for example, he allocated more than $60 billion of federal funds from the American Recovery and Reinvestment Act to save or create an estimated 400,000 jobs throughout the education sector. 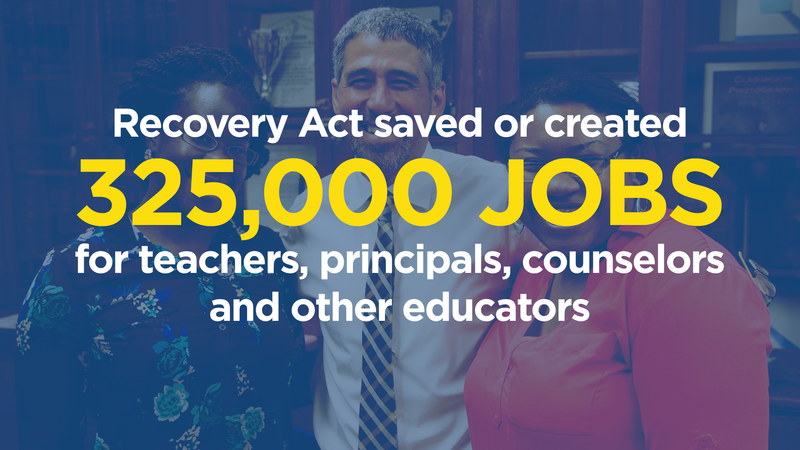 Apart from the substantial role the Recovery Act played in preserving teachers’ jobs, the Obama Administration worked to fortify the profession, including investing approximately $2.9 billion investment since 2009 to develop educator talent and support educators in high-needs school districts. Teachers and principals have helped improve education on a national scale by participating in the U.S. Department of Education’s Teaching Ambassador Fellowship program, which gives outstanding teachers the opportunity to serve as full- or part-time staff at the agency. The Obama Administration also established the Principal Ambassador Fellowship to include the important voice of school leaders. Both sets of fellows contribute to policy discussions that affect the work educators do each day in classrooms. Because our students need great teachers, educators need opportunities to be leaders in their profession even as they continue teaching in their classrooms. Recognizing this, the Obama Administration launched Teach to Lead and a predecessor effort called the RESPECT (Recognizing Educational Success, Professional Excellence, and Collaborative Teaching) project to elevate the voice and expertise of teachers to bring about better outcomes for students. Both projects kicked off a national conversation with teachers, principals, parents, and other stakeholders to develop a shared vision for transforming the teaching profession. Today, Teach to Lead continues its efforts to support teacher leadership by hosting regional leadership summits that spotlight and advance the groundbreaking, teacher-led work that is happening in states, districts, and schools across the country. The Obama Administration believes that educating all students — especially those who are historically underserved and most vulnerable — is part of our most critical work as a nation. Research consistently shows what many of us know: a great teacher makes a world of difference in the lives of students. Yet, too many young people — especially students of color, low-income students, and other historically underserved children and youths, who, too often, trail their more advantaged peers in academic achievement — do not have access to the teachers and school leaders who can best help them succeed. Research also shows that the quality of the teacher at the head of the classroom is dramatically impacted by the school leader. Effective school leaders ensure the skillful recruitment and placement of quality teachers. Not only that, but teachers themselves report that the quality of school leadership is often one of the biggest factors in both short- and long-term teacher retention, as well as teacher job satisfaction. 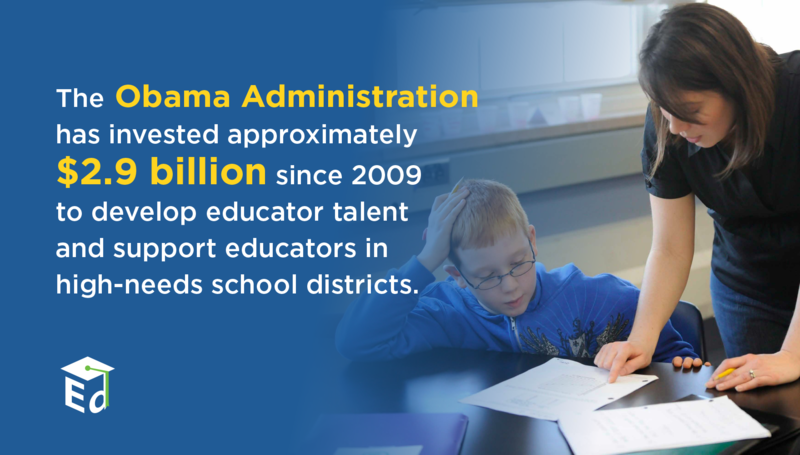 The Obama Administration has led efforts to help states and school districts support great educators for the students who need them most. And the nation is seeing strong results. For example, the Administration launched the Excellent Educators for All initiative and called on states to develop plans that would give low-income students the same access to high-quality teachers as their more affluent peers. The effort included a $4.2 million technical support network to help states plan this work. The Department of Education then published a report that highlighted which states and districts fared well or poorly on teacher equity. The President also proposed the RESPECT: Best Job in the World initiative in his fiscal year 2017 budget request, totaling $1 billion, designed to make the highest-needs schools the best places for teachers to advance in their careers while significantly improving outcomes for our most disadvantaged students. From the very start, the President focused on preparing, recognizing, encouraging, and rewarding great, diverse educators to thrive in the profession. The Department of Education proposed regulations to help ensure that teacher training programs prepare educators who are ready to succeed in the classroom. The proposal builds on reforms and innovations already happening at the state and local levels across the country. The regulations shift the focus from mostly inputs to outcomes, such as how graduates are doing in the classroom, while giving states the flexibility to determine how program performance is measured. In recognition of the fact that attracting and retaining the best talent to the teaching profession will shape public education in this country for decades to come, the Administration launched TEACH to recruit the next generation of teachers for America’s classrooms. And through competitive grant programs, such as Supporting Effective Educator Development, the School Leadership Program, Teacher Quality Partnerships, and Transition to Teaching, the Department of Education encouraged institutions of higher education, local school districts, and nonprofits to focus their efforts on recruiting and supporting effective educators in schools with our most underserved students. One key to preparing a strong teacher workforce is to increase teacher and school leader diversity, especially in our most underserved schools. This is critical because we know that educator diversity in our schools is beneficial for students and educators alike. That is why the Department of Education released a first-of-its kind report examining the state of diversity in the educator workforce. The report highlighted a lack of racial diversity among teachers at public elementary and secondary schools across the nation, with less than one in five U.S. public school teachers — 18 percent — identifying as individuals of color. The Department also held a summit for participants to develop commitments to recruit, support, and retain teachers of color. Organizations such as the National Education Association, American Federation of Teachers, and Teach For America all pledged to find more ways to better recruit and develop teachers from diverse backgrounds. The President also promoted a nationwide focus on recognizing and rewarding excellence in teaching and improving opportunities for educators to hone or gain new skills as professionals. 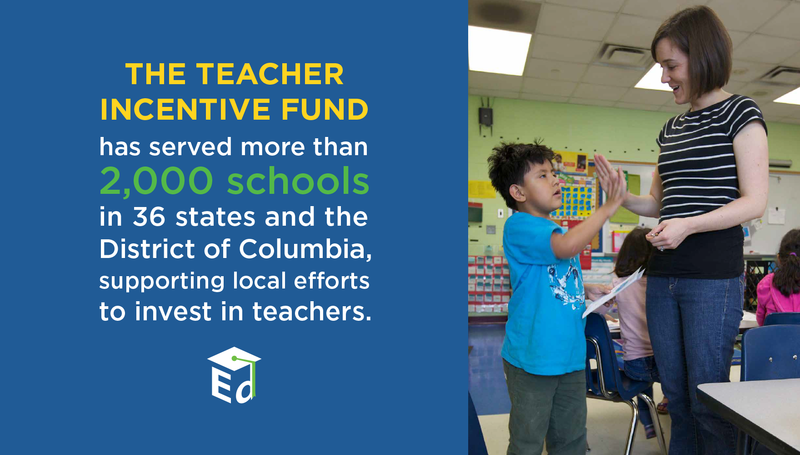 The Obama Administration increased funding for the Teacher Incentive Fund, which supports performance-based teacher and principal compensation systems in high-needs schools, primarily through grants to school districts. The program, reauthorized under the Every Student Succeeds Act (ESSA) as the Teacher and School Leader Incentive Grants, funded more than 130 projects at $2.1 billion to improve pay, reward effective teachers, and provide greater professional opportunities to educators in high-poverty schools. The projects have served more than 2,000 schools in approximately 300 urban, suburban, and rural school districts in 36 states and Washington, D.C. The Obama Administration also supported states and districts in establishing and implementing educator evaluation and support systems, aligned with two important goals — improving learning, especially for students who are struggling — and increasing the usefulness of evaluation and support systems to ensure continuous improvement and reward teacher excellence. 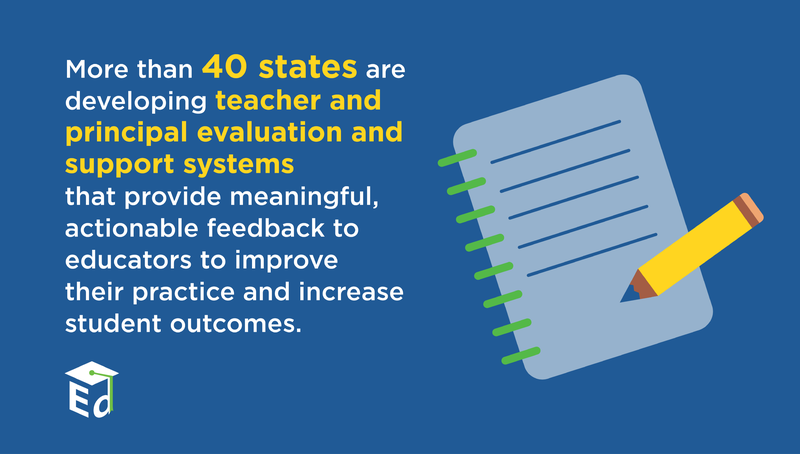 More than 40 states have committed to developing teacher and principal evaluation and support systems that reflect the Administration’s goal of ensuring that these systems provide meaningful, actionable feedback to educators to improve their practice and increase student outcomes. School leadership organizations such as ASCD, the National Associations of Elementary and Secondary School Principals, and New Leaders also are developing effective means and criteria for school principal evaluations. Ensuring every student receives a world-class education is a shared responsibility and requires collaboration at every level. With the passage of the ESSA in 2015, educators have a great opportunity to accelerate students’ performance through higher standards, more effective assessments, and expanded access to rich data and the latest technology that can inform their teaching practice. It is essential that we build upon this progress if we are to provide every student with a rich, rigorous education. Now and in the years to follow, teachers will determine, to a large extent, the strength of our country’s education system and the success of our students. While teachers will lead additional progress and improvements in education, it is also up to all of us to ensure that educators are well supported in this vital work.